Modern, high-end graphics processors (GPUs) are semiconductor marvels. Delivering massive transistor counts, tremendous parallel processing performance, and incredible 3D rendering speeds, they inspire intense technolust in serious PC gamers. But man does not live by GPU alone. If you want a high-end GPU, you must seek it on a high-end graphics card that may well be rife with other interesting upgrade features. Indeed, graphics cards themselves are feats of extreme engineering, marrying crafty circuit-board design to clever cooling strategies. Today we look at three single-GPU graphics cards, each a unique marvel of engineering. Two cards are built around Nvidia's latest GTX 680 GPU, and the other incorporates AMD's latest Radeon HD 7970 GHz Edition. The GTX 680 focuses on delivering tremendous gaming performance, while the Radeon HD 7970 GHz Edition is strong at games but also provides excellent GPU performance for nongaming applications that can benefit from using a GPU for computational tasks. Typically, Nvidia and AMD build reference boards with fairly conservative GPU and memory clock speeds. Card makers then take these reference designs, relabel them without changing much of anything, and offer them for sale. Lately, however, graphics card manufacturers have tried to differentiate themselves in a highly competitive market by creating their own board designs. These designs offer custom cooling, improved voltage regulation, and significantly higher core clock speeds than the reference designs do. Out of the box, they're faster than reference designs, but they also tend to be a little pricier. Let's take a look at a spec chart for these high-end graphics cards. Then we'll discuss each card individually in greater depth. The GTX 680 is a newer GPU than the AMD Radeon HD 7970, and card makers seem to be able to push its core clock speeds just a bit higher than the AMD's. However, differences in graphics chips' core clock speed don't always directly translate into performance differences. Now let's take a closer look at each card. Afterward, we'll dive into the performance test results. The Classified series comprises the highest-performance air-cooled cards that EVGA offers. EVGA GTX 680 Classified 4GB. The Classified card differs from its rivals in several ways. First, the EVGA GTX 680 Classified includes a staggering 4GB of frame buffer memory. Second, it uses two 8-pin connectors, as opposed to the one 6-pin/one 8-pin power configuration that most other GTX 680 cards use. The EVGA card also relies on a single cooling fan, rather than usual two or more fans. Finally, the card is unusually tall, at 5.94 inches, so you'll need to make sure that your case has sufficient height clearance to accept the card. The standard height for a PCI Express slot is 4.2 inches. The "DCII" in the name stands for "DirectCU II." Asus uses a direct-contact copper heat sink to assist in cooling the card. Asus GTX 680 DCII TOP. This is a massive card. Though not not quite as tall as the EVGA card, it occupies three PCI Express slot spaces inside a PC. It's also longer, at 11.8 inches, so you'll need a fairly deep case to hold the card. Your choice of motherboards is an important factor, as some vertically mounted SATA ports may be inaccessible to the GTX 680 DCII TOP. In return you'll get one of the most aggressively factory-overclocked cards on the market. Despite the exceptional 1137MHz core clock (which exceeds 1.2GHz in boost mode), the card is exceptionally quiet. You can hear the dual cooling fans spin up under load, but the Asus card is noticeably quieter than the EVGA card. Though idle power is slightly lower, the higher boost clock leads to more-demanding power draw under load. So when the card is running under a heavy 3D-rendering load, it consumes about 30W more than the EVGA card does when similarly occupied. The Sapphire Dual X is the only card of the three reviewed here that is based on AMD's Radeon HD 7970 GHz Edition—yet it doesn't quite clock at 1GHz, except under boost conditions. Sapphire Radeon HD 7970 Dual X OC. The Dual X isn't Sapphire's highest-end card, however, so the conservative setting isn't terribly surprising. The card has a more conventional size than the other two cards, as well. It's a full 11 inches long but only 4.7 inches tall, and it takes up two slot spaces. The dual-fan cooling system shroud is shaped to lessen the likelihood of problems involving motherboard ports, though the card's length could be an issue in relation to some motherboards and some relatively shallow PC cases. 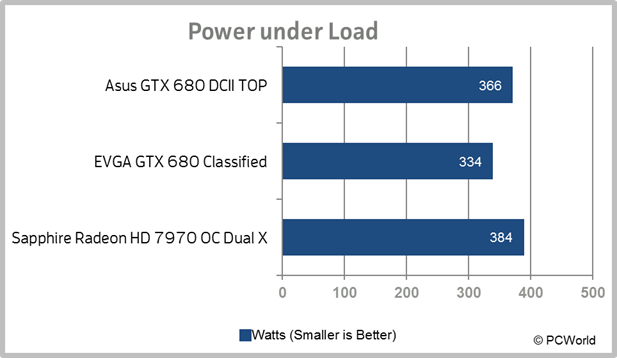 As we'll see shortly, the Radeon HD 7970 GHz edition tends to consume more power under load than the GTX 680. We did not overclock the system. We used a Watts Up Pro USB power meter to collect system power data. All of our game test results are reported at a resolution of 2560 by 1600 pixels, with 4x multisampling antialiasing enabled. 3DMark 2011, which simulates game rendering and GPU compute tasks. 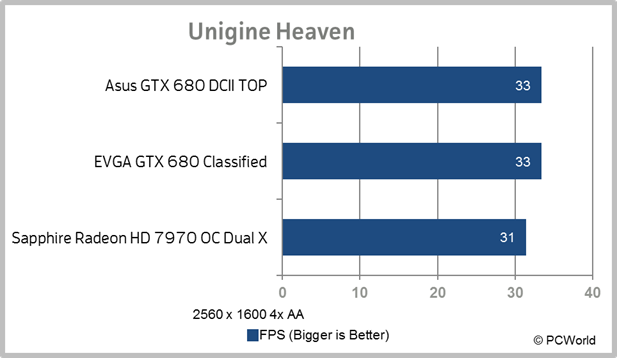 Unigine Heaven, which can hammer a GPU's hardware tessellation engine. Crysis 2, run with hardware tessellation disabled, since the game's use of tessellation is poorly implemented. Total War: Shogun 2. Dialing up all of Shogun 2's features makes the game a serious memory hog when handling video. DiRT Showdown. The latest version of the DiRT racing franchise implements global illumination using GPU compute. DiRT 3. The older DiRT 3 test is more conventional in how it handles DirectX 11 rendering. Metro 2033. This older first-person shooter can still stress graphics cards. Batman: Arkham City. The sequel to the sleeper hit Arkham Asylum offers a series of fly-throughs at different levels to test graphics performance. Few people use their PC exclusively for gaming, so it makes sense to test both idle performance and performance under 3D load. Idle performance is close to what you'll see from these cards when you run normal desktop applications on your system. Of the three cards we tested, the Sapphire model consumed the least power when idling, but it also drew the most power under load. 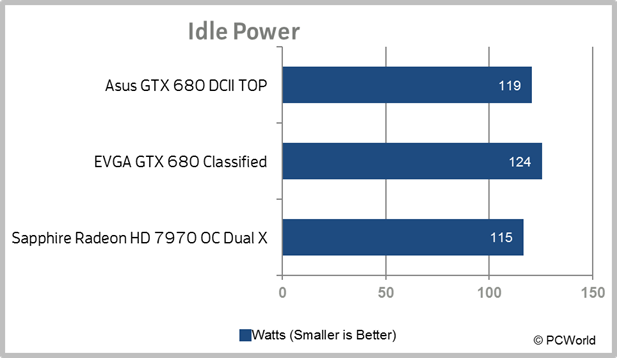 The idle power difference between the HD 7970 and the Asus GTX 680 is minimal, however. Load power consumption differences are more substantial, but even the 18W difference there won't greatly affect your power bill. The Sapphire card was a little louder than the Asus card, but a little quieter than the EVGA GTX 680 Classified. All three cards were considerably less noisy than the previous generation's high-end cards, however. This is partly due to their improved power efficiency: These cards just don't get as hot as their predecessors did. In addition, the manufacturers have worked to tune their cooling systems to minimize more-noticeable, higher-frequency noise. These two synthetic benchmarks make somewhat harsher demands on GPUs than most games do, though the type of load doesn't always reflect what modern games are doing. Think of these benchmarks as tests of potential, rather than real, performance. 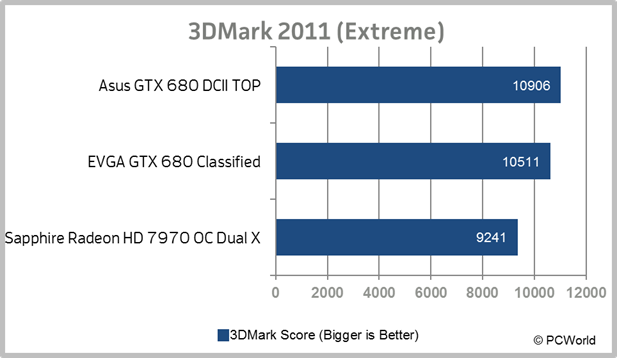 The Asus GTX 680 DCII TOP won out in 3DMark 2011 by a wide margin. The differences in the Unigine Heaven test became less noticeable once we turned on antialiasing. Still, the results for the two GTX 680 cards were pretty close whether antialiasing was turned on or off, and both of them eked out wins over the Sapphire card. When we look at the results of actual game testing, we see that performance differences tended to vary from game to game, depending on the kind of game load presented. Each game in our test suite approaches 3D rendering chores in its own way. 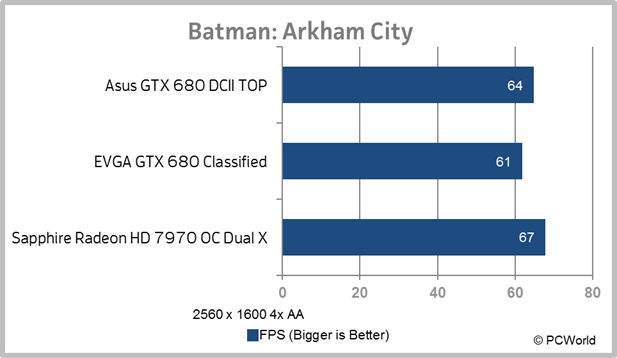 The Radeon HD 7970 did fairly well on Crysis 2. 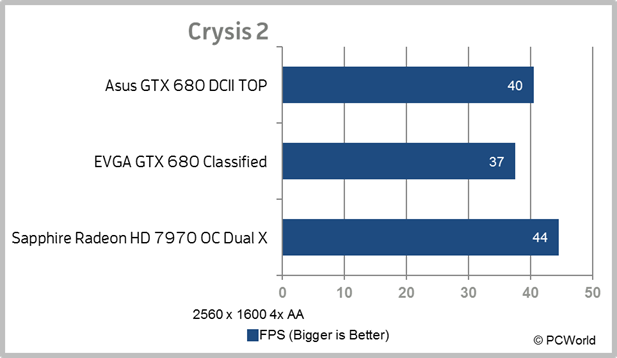 Notably, enabling hardware tessellation in Crysis 2 flipped the result, with the Nvidia GPUs outperforming the AMD. But Crysis 2's tessellation isn't very smart, which prevent it from being a very representative example of how most games use tessellation. Shogun 2, the memory hog. The Asus TOP card pretty much cleaned up on Shogun 2. 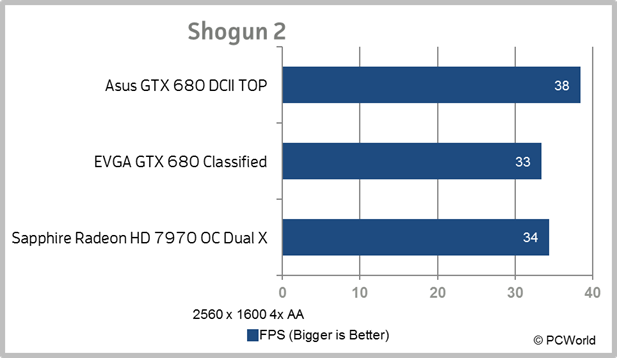 Shogun 2's heavy use of graphics shaders put the Asus card's high core clock speed to good use. DiRT Showdown uses GPU compute for its advanced lighting engine, particularly when handling global illumination. The differences in GPU compute performance were especially noticeable in this game test. We can't predict how many future games will use the techniques that DiRT Showdown employs, but it is an interesting example. 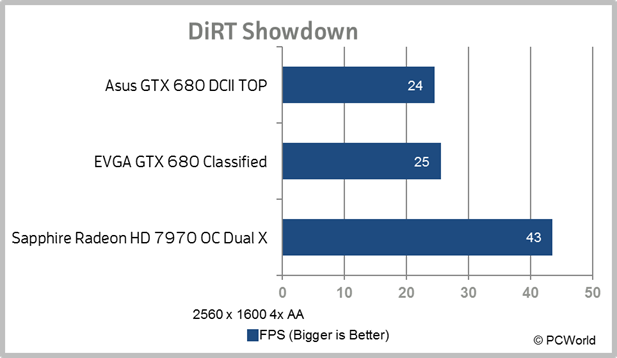 The Radeon HD 7970 demonstrated a clear and unambiguous performance advantage in this game. The older DiRT 3 uses more-traditional DirectX 11 rendering techniques. At our test resolution, it also seems to be CPU-bound, and the result was a dead heat. Metro 2033 is a massive system hog, as the low overall frame rates on this test indicate. AMD earned a technical knockout here, but the differences overall weren't that large. Batman: Arkham City is a much more conventional game, and our test cards were clearly up to the task of running it well. Once again, the Sapphire captured first place (by a margin of 3 frames per second), but all of the cards turned in frame rates well over 60 fps, so the practical differene in results is minimal. All three cards performed well on most games, and the differences between them were generally small. The outlier here involved DiRT Showdown—but elsewhere the results were pretty even. The EVGA GTX 680 Classified is an intriguing but ultimately imperfect card. It includes 4GB of video memory, so if you plan on running three 1080p monitors using Nivida's 3D Vision stereoscopic display technology, this card might be a good choice. On the other hand, the extra height makes it problematic to install in many cases—and it's a little noisier than the Asus card, too. The dual 8-pin power connectors might mean that you can manually overclock it to a greater extent, particularly with EVGA's excellent Precision X overclocking software; but many users may feel skittish about overclocking a GPU that's already pushed pretty hard. At $475, the Sapphire Radeon HD 7970 Dual X OC wins the crown for best price/performance ratio. However, it consumes a little more power and makes a little noise than the Asus GTX 680 DCII TOP. I would be inclined to go with the Asus card based on noise levels alone. The massive Asus GTX 680 DCII TOP is about as quiet a high-end card as I've ever heard. And at $550, it costs substantially less than EVGA's Classified card. 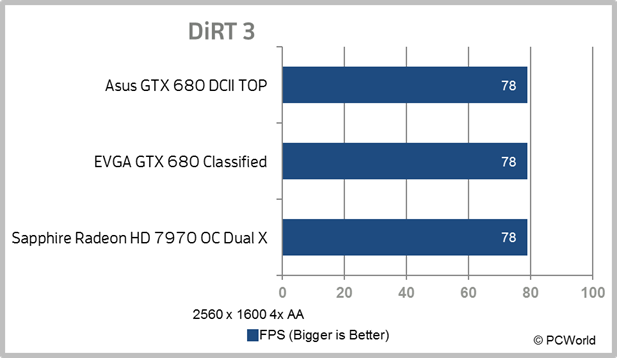 If you want the performance, but not the noise, of a high-end GPU, the Asus GTX 680 DCII TOP is a great choice.